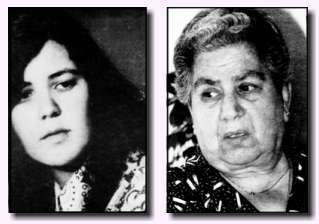 In 1955 Olga Konstantinidou gave birth to a beautiful baby girl. The difficult years forced her to give the baby for protection to the orphanage of "St. Stylianos", with the condition to take it back. The mother used to visit her baby very often. At one of her visits she was told that her daughter had died. Of course, that was another false death. The child was given for adoption in the village Nigrita of Serres City. The authorized people of the institute said that she was an exposed child without identity. When she was 15 years old her adoptive parents died. Vana, alone now, left from the village. When in 1995 Mrs. Kalfopoulou, the president of S.E.A.S.Y.P association brought into the surface the terrible crimes of "St. Stylianos", Mrs. Konstantinidou started with the help of the association, her own search. At the documents of the institute she found out that her daughter had never died and that the child had two records, one true and one false. She found the adoptive family and she went to look for the child which she had brought to this world. Unfortunately, the traces of Vana Patra were lost. In cooperation with S.E.A.S.Y.P association she made the identity of her daughter. One tragic coincidence was fatal for the discovery of her child. In 1998 Vana Patra had a car accident from which she survived. That unfortunate moment of her life became the link, which reunited her with her biological mother and her 29 years old sister. Another crime, of the hundreds that used to happen in "St. Stylianos" and with the cooperation of different hospitals and clinics all over Greece, reached its end. But who will pay for those crimes? Who can close the endless wounds that were once opened and are still bleeding? It is high time for the crime to stop. It is the right of every mother to hold into her arms her child again.